BYS: Statement regarding B.A.P’s ‘ALL THE WAY UP’! Statement regarding B.A.P’s ‘ALL THE WAY UP’! (This is) a notice regarding the included track, “ALL THE WAY UP”, from the B.A.P seventh single album ‘BLUE’ that was released on September 5., 2017. On the past February 27 of 2017, the company(TS Entertainment), while collecting songs that will be included in the B.A.P seventh single album, received from the publishing company (the company that manages the producer and the producer’s demo as well as the copyright), “THE KENNEL”, the demo for 'ALL THE WAY UP". On May 31 of 2017, the company(TS Entertainment) asked “THE KENNEL” As the availability of use of 'ALL THE WAY UP" and received an answer that there is no problem in the use of the song. On June 1., 2017 the company(TS Entertainment), through the publishing company, received the final confirmation of the original producer(David Anthony) and again gained confirmation that there is no issues regarding the use of the song. To this, (TS Entertainment) received the data for 'ALL THE WAY UP" from the corresponding producer and the publishing company “THE KENNEL” and after completing payment for the monetary fees regarding the song usage, progressed to recording (the song) with the B.A.P members. Following the procedures above, the company(TS Entertainment) released the song 'ALL THE WAY UP" as an included track of B.A.P(’s) seventh single album “BLUE” on the past September 5., and B.A.P progressed to the first broadcast of 'ALL THE WAY UP" on the 6. on MBC every1 “Show Champion”. The company(TS Entertainment) recognized the issue after B.A.P(’s) first broadcast and ascertain the truth, requested to the publishing company “THE KENNEL” for the regarding documents for this issue (and) received an apology from the CEO of “THE KENNEL”, Hayden BAI, about the risen issue. 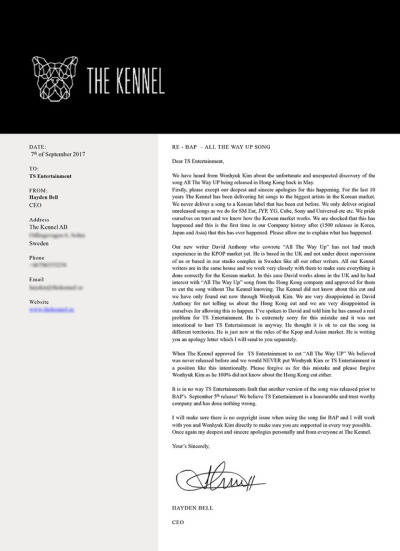 Following is the original apology statement received directly from the CEO of “THE KENNEL”. TS Entertainment will do its best that there will be no problems further problems with the promotion of B.A.P’s seventh single album “BLUE”. Furthermore, (we/TS Entertainment) would like to inform that regarding this issue, for the company artist’s rights and interests and the fans who continue to give endless support, the company(TS Entertainment) will do its best that there will no longer be any more harm. (We/TS Entertainment) would like to again give a word of apology toward the fans who sent much love and support toward this issue for causing worries.